I arrived at Wakkanai station still feeling curiously tired. It was past 4:00 in the afternoon. The sun would be setting soon and I wanted to climb to the tower on top of the hill before night fell so that I could visit the 100th Year Memorial Tower. On the map I spotted a trail leading from the temple at the base of the hill to the top. It was a circuitous route, but I had few options, so I decided to walk it. What had looked like a wide road on the map turned out to be little more than a gravel pathway. After a ten- minute walk uphill the road became obstructed by fallen trees and brush. As I climbed over broken branches, into an ever-thickening wood, I couldn’t help but be reminded of the poem “Road Not Taken” by Robert Frost. Indeed I had somehow chosen that road, and it looked like this road had not been taken since gravel was lain. I took wide breathless strides, all the while telling myself that the faster I walked, the faster I would be there. Uphill there was a bend in the road. Around the corner pathway was obscured by the thick brush. At the slow pace I was moving I was worried that I would not be able to reach the top of the hill and make it back down before nightfall. 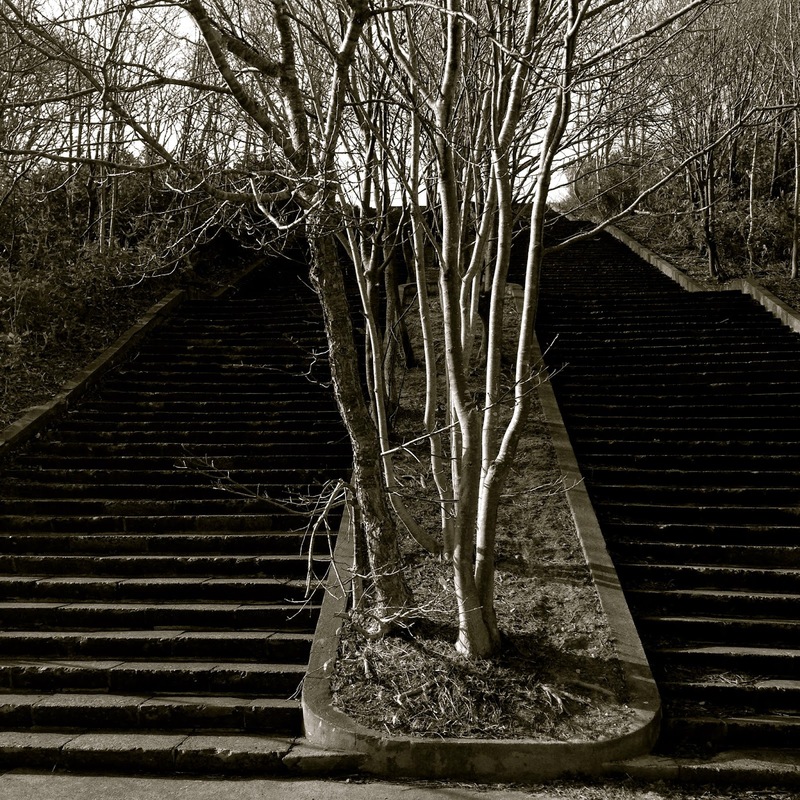 When I rounded the bend I discovered a wide stone staircase leading from the gravel where I stood, to an expansive sky. It was possible these stairs were a shortcut to the top of the hill. My map showed no mention of them. I hesitated briefly before deciding to ascend. What lay beyond the horizon of those steep steps did not come into full view until I had ascended the final step. Quickly abandoning all desire to see the Memorial Tower, I spent the twilight hours slowly weaving in between rows of Buddhist tombstones. 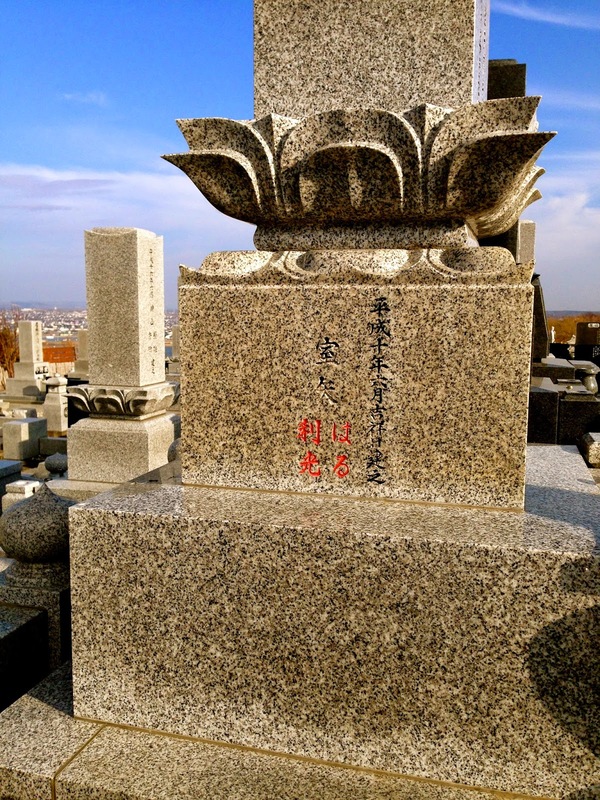 Since my first visit to Japan in 2002, I have visited many cemeteries all over the country. I thought I had seen all the Japanese cemeteries had to offer, and my excitement at exploring Japanese cemeteries had long since wore off. But something was fresh about this place in Wakkanai, something yet undiscovered by my curious eyes. With wild excitement I went about photographing the numerous statues of Buddha, each one with a unique face and body, each one in a different pose. I was reminded of the time I spent as a child in the old Catholic cemetery in Galveston, Texas. That time I became fascinated with the many statues of the Virgin Mary, every one of them different. That day I learned there were as many Virgin Marys as there were people. 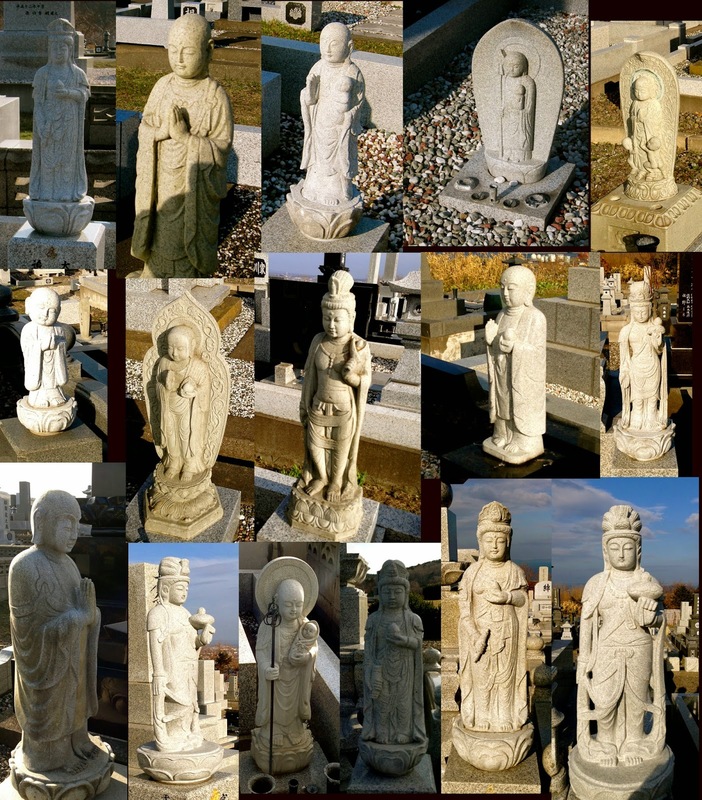 Today I learned that there are as many Buddhas as there are people. And here I was, back at my roots. 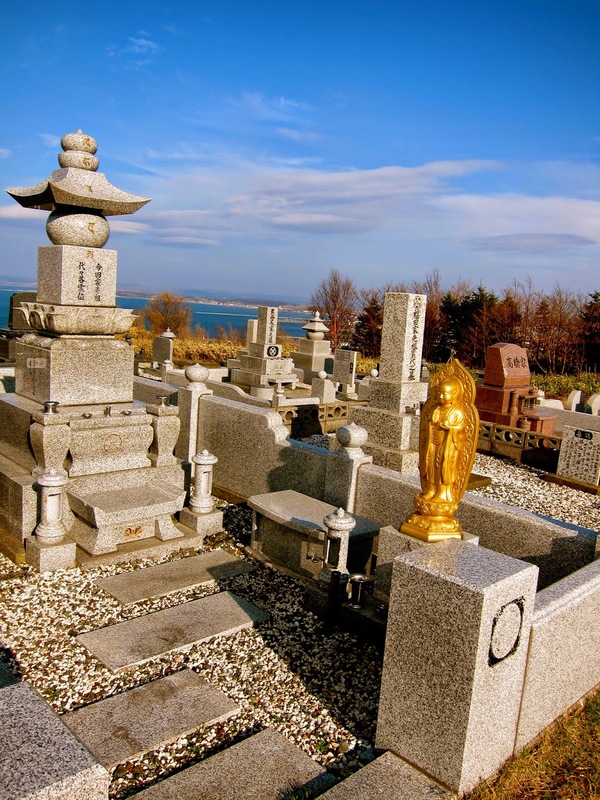 Like the curious ten-year-old who wanted to catalogue the face of every Virgin Mary in a rural Texan cemetery, the grown woman was not cataloging every Buddha in a cemetery in rural Hokkaido. Like nearly all cemeteries in Japan, being located on the top of a hill meant that a spectacular view was to seen. I sometimes wonder if the Japanese bury their dead on the tops of hills so that they can watch over the city below them. The view from the graveyard looked out onto the whole town and beyond, to the unbound sea and the wall-less sky, cradling the earth in a great ghost of atmosphere. After photographing the Buddhas and the view, I thought I had seen everything, and I headed back towards the stairs. That's when I caught sight of something unusual. Something red. 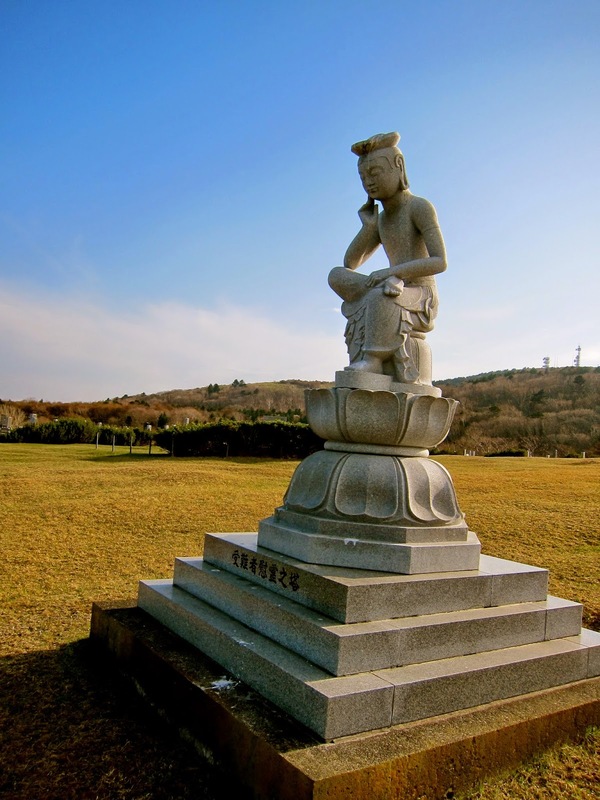 Color is an usual sight in a Japanese graveyard, where the stones are black, grey, or powdery white. In that expanse of monochrome, my eyes picked out a name. A red name etched onto a black stone. This was a tombstone for the living. Red names are an increasingly uncommon sight in Japan, but not entirely unheard of. 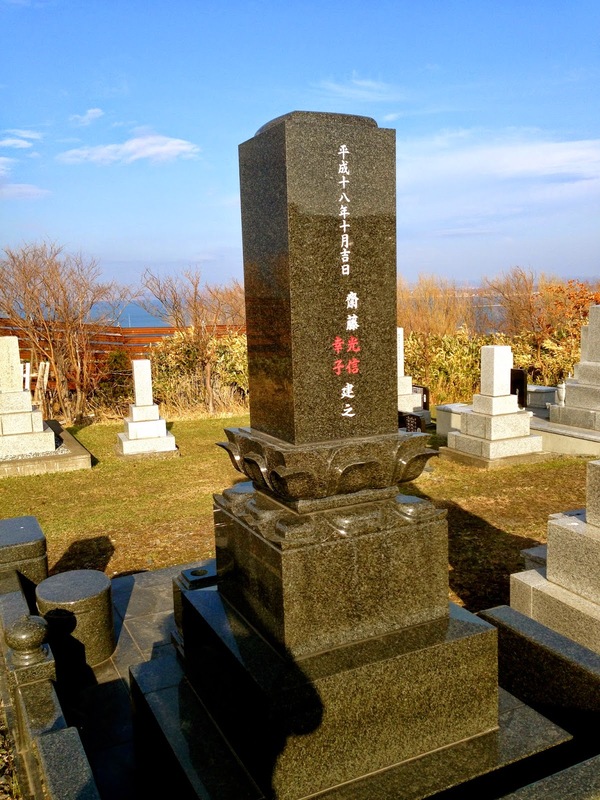 In Japan, a single tombstones is rarely only for one person. Most grave stones house entire generations of the same family. For that reason, the names of many people are engraved onto one stone. On this particular black stone, several names were white, meaning that those people had died and their ashes were buried at this grave site. The red name was of a family member who is still alive. 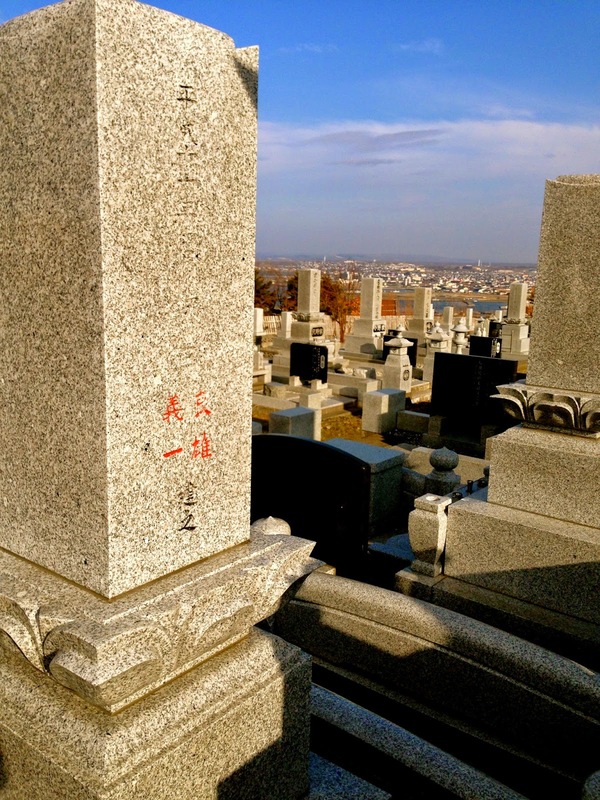 When that person dies, the red ink on their name will be removed thus making it white, their ashes will be added to the family plot. I read about this custom on the internet, but In all my travels through Japan, this was my first time to see it. I believe this custom is exceedingly rare. 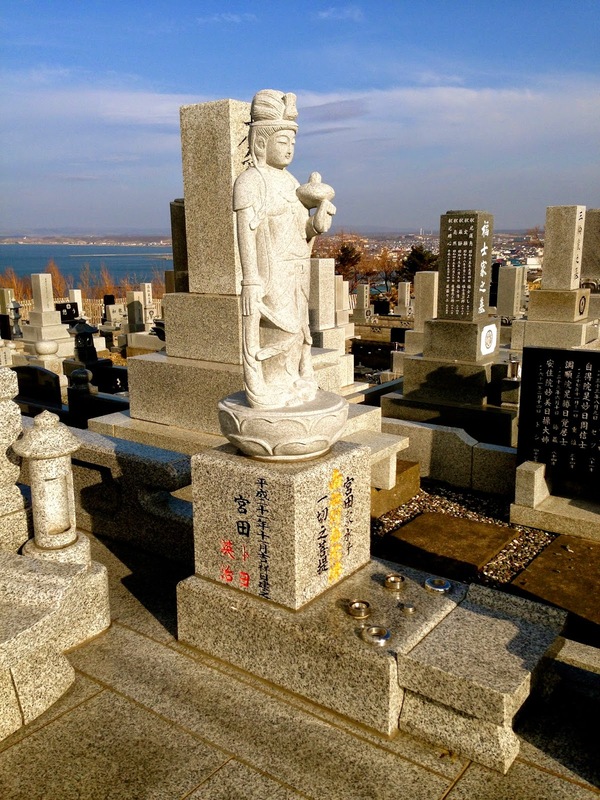 The practice has economic origins, as it is cheaper to engrave all the names of the tombstone at once, and in such a case it becomes a necessity to differentiate between those family members still living and those who are deceased. But these days many people find it unsettling to see their own name on a tombstone, waiting for their ashes. After noticing one, I found many more tombstones with red engravings. For a graveyard enthusiast like me, this was akin to discovering the tombstone jackpot. I skipped gleefully down the steps and walked down the gravel pathway back into town. I wouldn't see the Memorial Tower today, but somehow I felt like I would return to Wakkanai. I do like it and can feel the slow pace & calming moment just reading this story. 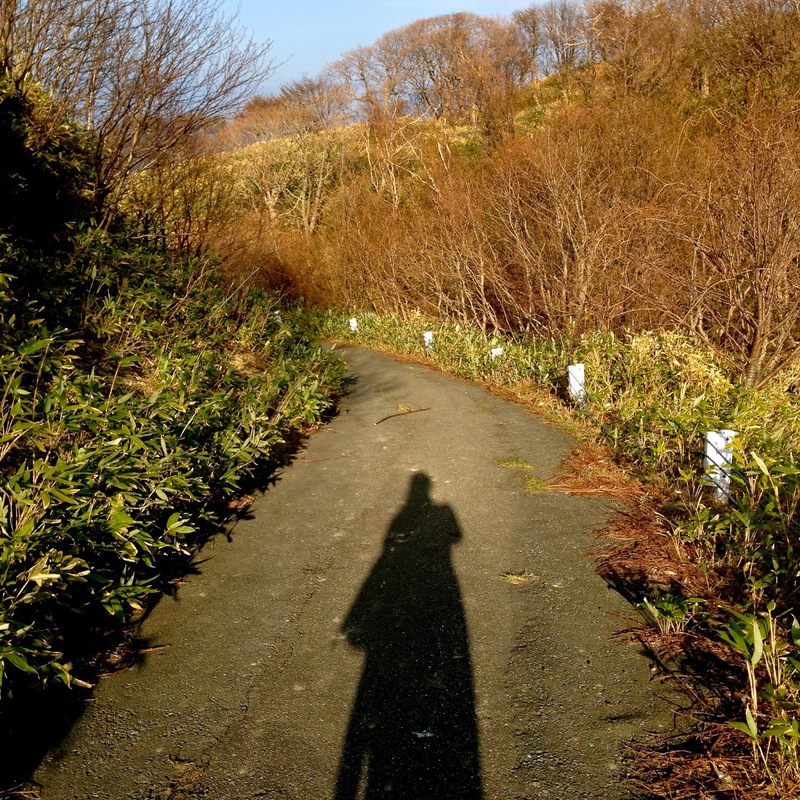 Moreover, it's such off-beaten destination in the northernmost of Japan. Thanks George! I loved Wakkanai and I hope to go again. Have you been there? When I went there in 2014, it was difficult to find information from the internet, and even in Japanese very few bloggers had covered northern Hokkaido. I'm glad to see that more people are taking an interest in this beautiful place. No I have not, but I do like Japan's rural area, especially Hokkaido. Rebun and Rishiri island are my wishlist to visit there some day. That's a web about Hokkaido owned by my local friend there.